I’d like to share details about a webinar we are running next Tuesday, April 30th on how to improve your assessments. You can register for the webinar here. A lot of assessments focus on testing knowledge or facts. Questions that ask for recall of facts do have some value. 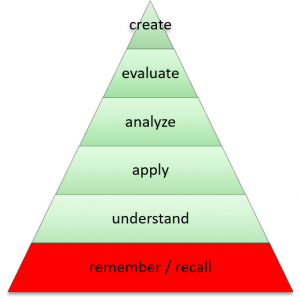 They check someone’s knowledge and they help reduce the forgetting curve for new knowledge learned. But for most jobs, knowledge is only a small part of the job requirements. As well as remembering or recalling information, people need to understand, apply, analyze, evaluate and create as shown in Bloom’s revised taxonomy right. Most real world jobs require many levels of the taxonomy, and if your assessments focus only on recalling knowledge, they may well not test job competence validly. Evaluating includes exercising judgement, and using judgement is a critical factor in competence required in a lot of job roles. But a lot of assessments don’t assess judgement, and this webinar will explain how you can do this. You can write objective questions which test understanding and application of knowledge, or analysis of situations. For example you can present questions within real-life scenarios which require understanding a real-life situation and working out how to apply knowledge and skills to answer it. It’s sometimes useful to use media such as videos to also make the question closer to the performance environment. You can use observational assessments, which allow an observer to watch someone perform a task and grade their performance. This allows assessment of practical skills as well as higher level cognitive ones. You can assess people’s actual job performance, using 360 degree assessments or performance appraisal. In our webinar, we will give an overview of these methods but will focus on a method which has always been used in pre-employment but which is increasingly being used in post-hire training, certification and compliance testing. This method is Situational Judgement Assessments – which are questions carefully written to assess someone’s ability to exercise judgement within the domain of their job role. It’s not just CEOs who need to exercise judgment and make decisions, almost every job requires an element of judgement. Many costly errors in organizations are caused by a failure of judgement. Even if people have appropriate skill, experience and knowledge, they need to use judgement to apply it successfully, otherwise failures occur or successful outcomes are missed. Situational Judgment Assessments (SJAs) present a dilemma to the participant (using text or video) and ask them to choose options in response. The dilemma needs to be one that is relevant to the job, i.e. one where using judgement is clearly linked to a needed domain of knowledge, skill or competency in the job role. And the scoring needs to be based on subject matter experts alignment that the judgement is the correct one to make. Situational Judgement Assessments can be a valid and reliable way of measuring judgement and can be presented in a standalone assessment or combined with other kinds of questions. If you’re interested in learning more, come to our webinar next Tuesday April 30th. You can register here and I look forward to seeing some of you there.